Learn how to grow (and consume) sprouts, shoots, and microgreens at home without using expensive or complicated equipment—all you need is tap water and a glass jar, and you’re ready to go! This is an easy, fast, and smart way to fit healthy greens into your diet. 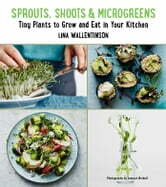 Following Lina Wallentinson’s instructions, in just a few days, you’ll see dry seeds transform into burgeoning green sprouts.